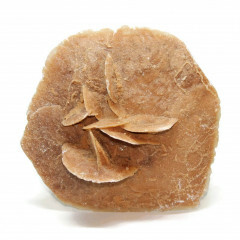 Desert Rose is an interesting crystal cluster made of Baryte, Gypsum, or Selenite. It forms in a pattern that actually does look like a rose with petals. A colloquial name for what are sometimes known as gypsum or baryte formations, which are abundant with sand grains. They create distinct ‘petal’ like arrays reminiscent of rose blossoms. In some locations, sand with a high iron oxide content can give the rose a unique rustic red tone. Roses are almost always sold rough – I have never seen a polished piece, and due to its fragile nature it is unlikely to be suitable for tumbling. Smaller ‘roses’ look less like petalled flowers than their larger counterparts. I personally find that they remind me of chocolate truffles.. They are sometimes referred to as ‘sand roses’, ‘rose rocks’, ‘selenite roses’, ‘gypsum roses’ or ‘baryte roses’. Clusters of up to a metre tall have been found in Oklahoma USA, but they are found in some parts of Africa, Spain, Australia, the UAE, and Mexico. The stone is said to fortify mental ability and clarity, as well as cognitive perception of all kinds, including intuitive/physic perception – this makes it especially well suited for the Crown chakra. It is an ideal stone for those born under the star sign Cancer.